The Arista 7160 Series is comprised of high-performing Ethernet switches designed primarily for data centers, but they’re also great for large-scale enterprises. These are powerful, compact switches with a high port density, making them perfect if you’re looking to buy pre-owned Arista switches in bulk. This also makes 7160 Series switches extremely scalable, whether you need to add to your existing network now or down the road. We offer great prices on used Arista 7160 Series switches, and we make the entire purchasing process incredibly easy. Keep reading to learn more about all the pre-owned Arista 7160 Series switches we stock. There are three Arista 7160 models: the Arista 7160-32CQ, the Arista 7160-48YC6 and the Arista 7160-48TC6. All three feature a compact, fixed configuration 1-rack-unit (RU) design. Between these three models, you can select an Ethernet switch that supports up to 10G Ethernet, 25G Ethernet, 40G Ethernet and 100G Ethernet. However, the ports on each switch vary significantly, as do several other specifications. Another benefit of buying used Arista 7160 hardware over other Ethernet switches is the fact they’re designed to be incredibly energy efficient, at only 10W per 100G Ethernet port. All three Arista 7160 switches also include the AlgoMatch feature, which helps improve power efficiency. 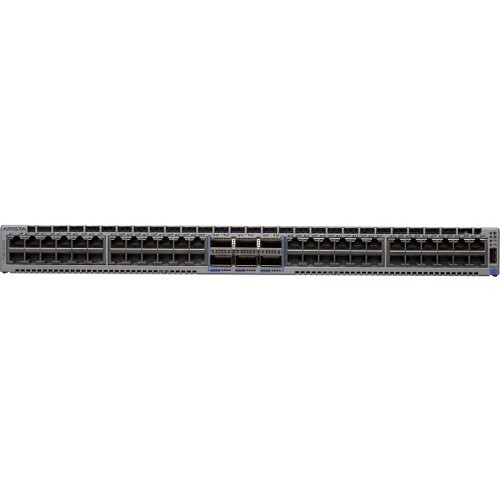 Of the three available Arista 7160 Series switches, this is by far the highest performing one. It’s designed primarily for 100G Ethernet, but it supports many other Ethernet speeds as well, including 10G Ethernet, 25G Ethernet, 40G Ethernet and 50G Ethernet. The Arista 7160-32CQ is made with 32 QSFP28 ports and four SFP ports. The ports that support the QSFP28 form factor can be configured for a wide variety of Ethernet speed combinations. You can set up 32 lines of 100G or 40G Ethernet, 128 lines of 25G or 10G Ethernet or even 64 lines of 50G Ethernet. All you need are the right cables and optics. Because the Arista 7160-32CQ has the most high-speed Ethernet ports, it has the highest maximum capacity of the Arista 7160 switches at 6.4 Tbps. The Arista 7160-32CQ is also the only one of the three that supports a solid-state drive (SSD) addition. This is the mid-tier Arista 7160 switch — in terms of specifications. Nearly all of its ports are made for 25G Ethernet, although it does have some 100G Ethernet ports. It has 48 ports that support up to 25G Ethernet and six ports that support up to 100G Ethernet. But the 25G Ethernet ports are made with the SFP28 optical form factor, which means they can also be configured for 10G Ethernet. The maximum number of 10G Ethernet ports supported on the Arista 7160-48YC6 is 72. The maximum number of 40G and 100G ports is six. The 7160-48YC6 switch has a maximum capacity of 3.6 Tbps. Although this switch does not support the option for an SSD, it does include two USB ports, whereas the Arista 7160-32CQ has only one USB port. The biggest difference between this switch and the Arista 7160-48YC6 is that the Arista 7160-48TC6 has SFP ports instead of SFP28 ports. Those ports only support up to 10G Ethernet instead of 25G Ethernet. It does, however, have six 100G Ethernet ports. The maximum number of 10G Ethernet ports supported on the Arista 7160-48TC6 is 72; the max number of supported 25G Ethernet ports is 24 — with the 100G QSFP28 ports. One other specification to note is that the latency is 3usec, the highest of the three 7160 switches. 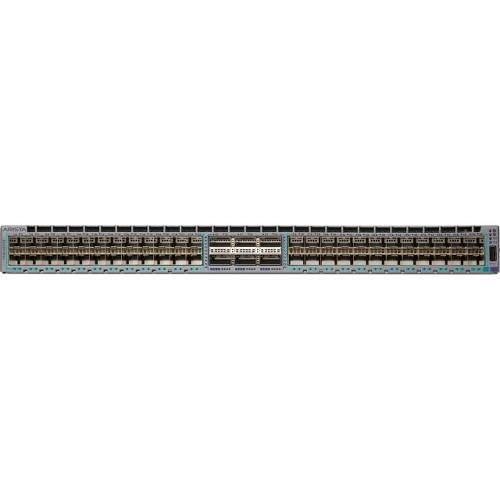 Arista 7160-48TC6 switches have a maximum capacity of 2.16 Tbps. And, like the Arista 7160-48YC6 switch, the 7160-48TC6 also doesn’t support an SSD option. But, like the Arista 7160-48YC6, it has two USB ports. In addition to selling high-quality pre-owned Arista 7160 Series switches, we also buy them pre-owned in bulk from enterprises, data centers and individuals all over the world. This not only helps us keep our used Arista 7160 prices down; it also helps us maintain our inventory. Ultimately, our goal is to make it simple and easy for you to sell us your pre-owned hardware. We start by gathering details on the devices you’re looking to sell. Then, we send you a quote. Depending on how much equipment you’re selling, you may require freight pickup. We not only help set that up; we cover the cost of all shipments, no matter how big or small. The only thing you have to do is make sure the equipment is packed up and ready to go. You don’t even have to know whether or not the equipment you’re selling works. For example, if you have hardware in storage that you want to sell, we don’t expect you to pull it out and test it. Instead, we test it for you using a thorough 9-Point Quality Control and Testing Procedure. We’ll even pay you in advance via credit, or we can cut a check once we’ve completed our tests. We not only offer competitive used Arista 7160 prices; we stick with you throughout the sales process. From the time you make your initial inquiry — either by calling us or filling out our contact form — to the time your order arrives, our team is with you every step of the way. Networking hardware is not something you purchase every day; we understand you’ll want to collect all the information you can before finalizing your order. So, whether you have questions related to product specifications, our sales process or installation, don’t hesitate to ask. In addition, every piece of hardware you purchase includes our BrightStar Systems’ 1-Year, In-house Warranty, which covers equipment failing to perform to manufacturer’s specifications. If you’re interested in buying or selling pre-owned Arista 7160 switches, please contact us and we’ll set you up with one of our knowledgeable sales representatives to get the process started. To see all the Arista products we stock and sell, head to our Arista page. And if you want to review more specifications for 7160 switches, head to the official Arista 7160 Series datasheet.